Worked hard all summer...took a hiatus to New York, but that was city living. 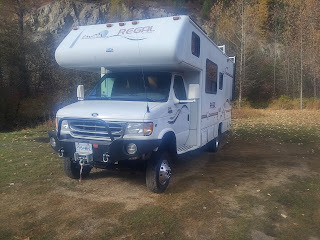 Now it's time for a bit of RV life, again. Canadian Thanksgiving was the 8th of October, so we took off the 6th for four days. I mean..I am retired but Sharon still keeps her real estate office, so we can't be not home nearly as much as we'd like. 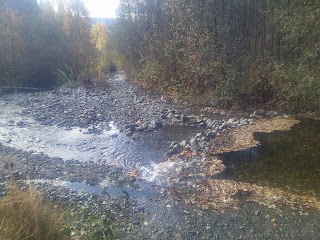 So...we headed south a bit to Oliver and then east on the Mt Baldy Mountain road..in search of Camp McKinney..a fabled gold mining derelict town. What a waste of time that was. Nothin. Well..not nuthin but nuthin old. Really great books and just looking at their site I guess it's time to buy the new editions. Right by a nice active stream with only room really for four RV's. Sharon loves it when can park so that the bed window is by the water...I get extra points for that. The really cool thing was the closed road that revealed this old cabin. And on to Midway..another blip in the Crowsnest Pass Highway...Rt 3. But it has a great municipal camp spot that we parked at to make some lunch. It had closed for the season but turns out they leave it open for people to use. How cool is that? Also Midway has a donkey....someone does anyway. Cutest damn thing ever....and the very jealous horse. On to Grand Forks...I mean these are all just dinky places that people call home. Most of the industries have gone away and how folks pay their city taxes I can't imagine. Some don't actually. The numbers of homeless in Grand Forks is significant. Winters are mean there..I don't know what people do. 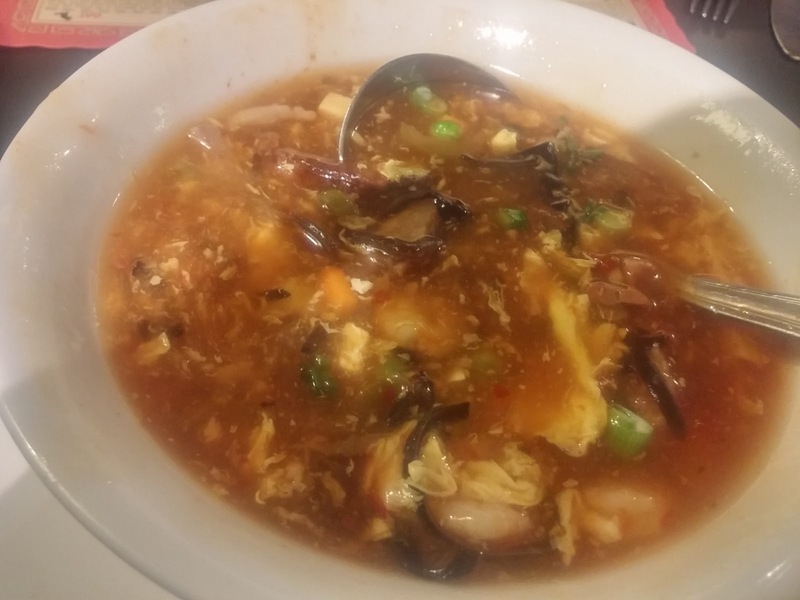 But...we had a nap and then were just about to start some supper when Ms Sharon decreed....Chinese food.....okay then....we'll start with some Hot n Sour soup! God I love that stuff. So...we drove into the City Park..all those NO Overnight Parking signs? Oh...well, we'll just ignore them..great night sleep. No one cares in off season. Our turn around point was the CDN-US border on 395...close to Christina Lake. Apparently a very major transportation hub was here..power and trains...cross border traffic was the key. There was a power plant right at the foot of where the the bridge is now. And across the bridge...looking down..and then west. We over-nighted in Midway on our last night out. In the picnic area...I wanted to be in an open area for the morning sun.